This is a repost of this article. Timely as in HNZ has just announced they’ll be shortly out of funds. No surprizes! Why if these people have degrees in accountancy are they running us into the ground peeps? Do check out the links recommended in the older article here (Agenda 21 and Banking), and read about the new debacle here. The Prime Minister John Key announced earlier this year that he intended to sell off 1000 to 2000 of NZ’s state houses. Large numbers of these homes were built by the first Labour government in 1935 and as of 2013 the stock numbered 69,000. That era had marked the birth of our welfare state and the tenants of the first house that was finished and let in 1937, paid just one third of their income in rent. Fifty years later we had the Labour government promising to remain involved in NZ’s housing market, then with the event of Rogernomics and Roger Douglas’s neo liberal economic policies (the new economic ‘experiment’ that benefited those at the top of the capitalist pyramid and launched the ever increasing gap between rich and poor) rents were raised to market rates. Tenants could then apply for a government subsidy called an accommodation benefit, effectively subsidizing the landlords. By 1997, 60 years later, tenants were paying three quarters of their income in rent. The welfare state in NZ, having officially begun with the Social Security Act in 1938 and the state ensuring every New Zealand family had at least a minimum standard of living, was now descending rapidly into an abyss of debt and for many, poverty. We’ve effectively gone from free milk in schools to kids with no lunch at all. In a recent article by Bryan Bruce, advocate for NZ’s children in poverty, and maker of the documentaries ‘Mind the Gap’ and ‘Inside Child Poverty‘, some interesting questions are raised, questions many New Zealanders have also been asking. Questions like why is the Key government selling off our state housing stock, especially when thousands of families have nowhere to live? NZ is in fact experiencing a housing crisis, described by the Salvation Army as an ‘unfolding social disaster’. On the one hand we have soaring house prices in Auckland that have so inflated the market few can afford them, and on the other, according to Auckland’s City Mission estimates, the numbers of people sleeping rough in Auckland for the year 2013-2014 virtually doubled. The NZ Parliament website states that a “2013 University of Otago study using 2001 and 2006 Census figures and emergency housing data estimated that 12,900-21,100 dwellings would be needed to house the 2006 severely housing deprived population. These were in addition to housing required to address other forms of need, and underlying demand”. In total, “An estimated 34,000 people, or about one in every 120 New Zealanders, were unable to access housing” in that year (University of Otago Monday, 23 September 2013). Now it gets interesting. The usual rationale proffered for asset sales since they began with Rogernomics, have been ‘to get us out of debt’ or ‘save us money’, giving the impression they are no longer breaking even let alone making a profit. Bruce however reveals that the HNZ corporation has in fact been making a very healthy profit (links in his article). Clearly it would be more prudent to keep this asset. Bruce raises questions like, where did those profits go? Why have they not reinvested the profits into the housing stock? Why sell housing stock in the regions when they are presumably encouraging folks to move to the regions? (Agenda 21 maybe? … the real plan for UN’s Agenda 21 aka Sustainable Development is to have populations relocated out of rural and into urban areas). 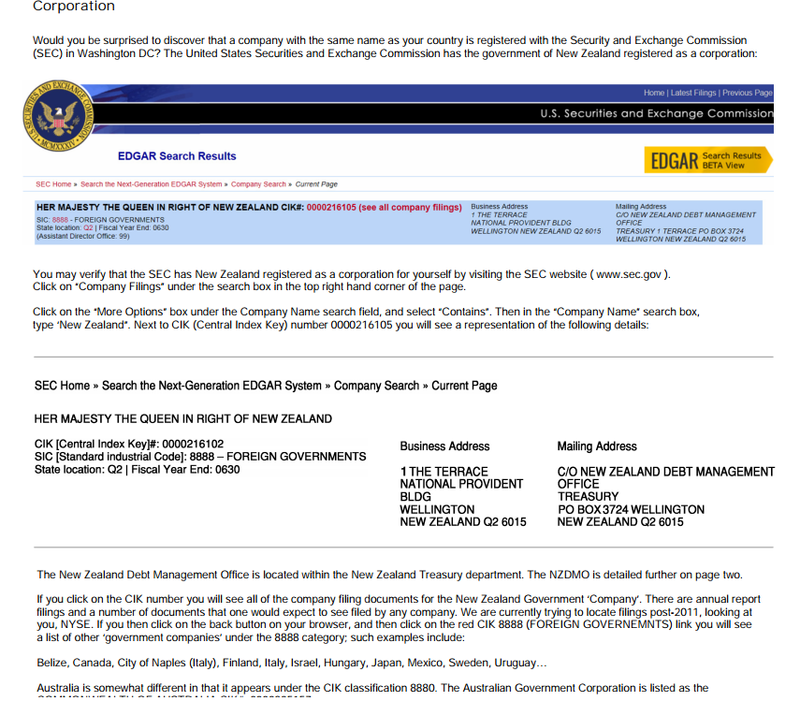 You may not be aware of this, but NZ is a corporation. Our country is listed on the Securities and Exchange Commission website as a corporation under the name of Her Majesty Queen Elizabeth. Most will be aware that corporations are required to turn a profit … to maximize profits is their legal mandate. They are not about, nor are they required to be about the welfare of people. (Watch two minute movie trailer for ‘The Corporation’ below). So as our corporation steams along at full speed, rapidly selling off both our country and its assets, those who head it up are giving us the impression they govern as elected representatives of the people. In a sense they do but their real agenda, their corporate bottom line, is hidden from view. Corporations if you study them, and as the above trailer illustrates quite succinctly, are not required to consider the effects their economic activities have on people. I strongly urge you to watch the full documentary on ‘The Corporation’ page. You will then be joining some dots and making sense of what is really happening in our midst. As long as we remain a corporation, poverty will not disappear. The welfare state has always existed merely to give capitalism a human face. That capitalism is now shamelessly profit driven and the human face is disappearing fast. Check out the links and see for yourself where and how we are listed on the Securities and Exchange Commission’s website here. See our Money pages for more info & links, &/or search categories for further related articles (at left of any page). Please like our FB page &/or follow our blog (right of any page) and do spread the word on all the untruths we have been told! this is what happens when you allow hoardes of refugees into the country, shouldnt housing NZ put priority in housing HOMELESS NEW ZEALANDERS over people that have been in the country a measley 36 hours? Whilst I do believe yes we need to show compassion to the desperate, still, yes our govt should be housing our own. Nats escalated this problem by their profiteering & gentrification spree. Definitely nonsensical. Kick them out, the Gov,. I so agree Desmond. ASAP! They are selling houses that nobody wants, either because of location or size, and using the money to build new ones in areas where they are needed. Makes sense to me! One would hope that is the case anonymous. We’ll see. I saw the other day a family being evicted from their Ak home because they couldn’t afford the hike in rent from $124p wk to over $500 pw. It is also very difficult to apply for one now let alone get into one. $500 per week in NZ? is that true? evenin over priced Australia you can rent a nice home in a regional town for $150 to $300 per week. Here is another related article regarding empty homes in Ak, bought from off shore & sitting empty … this is what happens when a basic necessity like a house to live in becomes an item of speculation. This is why the state homes in valuable real estate areas are being sold. And while John Key, Nick Smith and Paula Bennett are clearly taking advice from their PR minders by repeatedly referring to the lack of housing as a “supply issue” ( largely caused, they claim, by Auckland Council bureaucracy) the fact of the matter is that the root cause of our housing shortage lies in the Zombie economic ideas that still haunt the corridors of the Beehive and refuse to die. I’m sure you know two of their ugly faces well enough by now. Deregulation : the idea that the marketplace should be free of government intervention and Trickle Down: the misguided belief that if entrepreneurial people are left to get on with making money free of rules and regulations then we will all be better off. Our experience however is that ever since the introduction of neoliberal theory thirty years ago , the rise of the politics of selfishness and the advent of globalisation, the stuff you don’t really need in life, like flat screen TVs, have become very cheap while the things you DO really need like food and a place to live, have become extremely expensive. And that’s no accident. Getting control of scarce but vital commodities is a time- honoured way of getting fabulously rich. So yes, affordable housing IS a problem in our country and the fact that homes are lying empty while people sleep in their cars and under bridges is just plain wrong. However the cold hard reality is that until we face up to the fact that the way we run our economy favours a few wealthy people at the expense of the many there will be increasing numbers of homeless families seeking shelter at places like Te Puea Marae. Simplistic and deceptive explanation for the dumbed down to follow, even with the real objective clearly evidenced like a balloon pimple on the nose…PROFIT PROFIT PROFIT,.look carefully at case examples/evidence, blocks sold and redeveloped by capitalist friends&associates of the F/few %…and definitely no sufficient social replacement housing being built!?. Hit the nail on the head there Jim. They are playing fast & loose before they’re ousted (we hope) at next election,. Key is a banker & some of us know what they are up to. Hi Pam, good post. I was wandering the same thing myself, about why the government would sell off our housing stock when it was making a profit. I don’t think capitalism is the cause of poverty though, it’s the neo-liberal economic thinking that leaves everything to “the market” to sort out – when there is no free market. What we’ve got here are gigantic corporations stealing the word’s wealth, unchecked by governments. We’re a nation of small businesses. I’m a capitalist because I own a small IT business with my husband. Our job is to make a profit and benefit our society. Along with that comes benefits to our community. We keep e-waste out of the landfill, we provide a good service and we give people a choice about what goes on their computer. They don’t have to use Microsoft or Apple’s products if they don’t want to – something that’s really important at the moment given Microsoft’s unethical business practices and their behaviour with Windows 10. My fear is that our children are going to blame capitalism for the economic mess that bad governance has gotten us into, and they’ll embrace hard socialism – which has never worked anywhere. Nor does hard capitalism, as we are seeing. ‘Make a profit & benefit our society’ … yep is how it’s meant to be but I guess also the original proponents of such a plan rather gathered that human nature was unselfish, like yourself, who are now the rare exceptions! Yes it is neoliberalism for sure. I saw them introduce it. Bad scene. Now it’s neo lib on steroids. And yep the corporations. Profits above people their motto. Raison d’etre. I believe the socialism agenda is that of Agenda 21, posing as benevolence. I’ve discussed that on the Agenda 21 in NZ page. Heard about that in the ’70s from an evangelist/investigative journalist. A Kiwi too. He was onto the global governance agenda way back then. Why is the govt selling off our state housing stock when it has actually been making a profit?